Please read “Test Details” on this website before application. On-line application. Visit “On-line application form” on this website. Attach 1 JPG format photo. Must use candidate name as the photo file name. Photo will be shown on the certificate. Must be taken within 3 months. Maximum size 200 KB, 3x4cm, 354x472pixel. Showing full frontal face with clear facial features. Do not wear hat and avoid heavy make-up. Credit card only (Visa & Master). No entrance fees are refundable or transferrable to other person, date or level. Please read Statements. Successfully registered candidates will receive instant email confirmation. 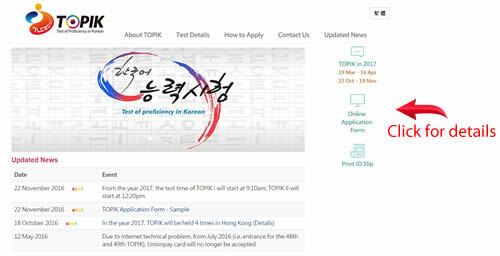 Candidate will need to click into “Print ID slip” on this website so to log on and print out the TOPIK Identification Slip & official receipt (candidate will be notified via email). Please note candidate must present valid personal identification and TOPIK Identification slip in order to attend the test. Must bring valid personal identification and the TOPIK Identification Slip, may bring one’s correction tape. For TOPIK II candidate, if only takes one session of the test, candidiate will be disqualified. Candidates must be seated on time at assigned seat. Place identification slip and personal document at the upper left hand corner of the desk. Each candidate will receive a dual points computer marker pen. All answers must be completed by using the given marker pen. Candidate can mark answers on question paper if needed. Use the thick-end of the marker pen to answer multiple choice questions. No points will be obtained when using other pens. To make corrections, use correction tape only (not fluid type). No points will be obtained if mark more than one answer. Use the fine-end of the sign pen to answer the writing questions. No points will be obtained when using other pens. To make corrections, use correction tape or draw two lines through. 13. For writing, words should be filled in corresponding boxes. No marks will be given for words outside of the boxes, fill in wrong boxes or writing more than 1 piece of answering paper. Place the answer sheet on the right hand side of desk and the examination paper on the left. Any candidate keep filling out answers after the test time has ended will have his/her test invalidated. Candidate may only leave the classroom after the finish bell rings at each session. Showing answer sheet to other candidate or viewing other’s answer sheet. Read book or memo during the test. Using of any communication device (mobile phone, MP3 player, beepers etc) or electronic device during the test. Falsifacation of personal identification or TOPIK identification slip. Sit the test in the name of another candidate. Record or copy question paper. Talking with, exchanging material or signal with another candidate during the test. Not following the instructions of the invigilator. Copyright © Korean International School, Hong Kong. All rights reserved.